Stress can come in all sorts of forms. It can be the anxiety caused by work, relationships, or even things that likely won’t even happen but we get worked up about them anyway. Lets see if we can find some ways to reduce the stress. I like to think stress is a pretty normal part of the life experience. Anyone who says they don’t have stress in their lives is likely shifting a perspective rather then denying that they have challenges that elevate their body with change in either a physical, mental or emotional way. Stress isn’t always a bad thing overall. When we go to the gym we put stress on our bodies, but that stress brings about a positive change overall. Perhaps maybe this elevated level of stress is to bring to your attention a potential dangerous situation. But there is a a kind of stress that relates to an anxiety about this that happened in the past or looming in the future. This goes beyond the way in which our bodies evolved in the flight or fight mentality that floods adrenaline into our system. This type of stress can be a killer and if not handled correctly can dig you into an early grave. When stress continues to be ever present without any breaks or let up, this can become very hazardous to our health. This continued build up of tension can cause a breaking point. Think of pulling back on two ends of a stick, eventually the middle will snap. The same goes to our health when there is this consistent level of stress. Is it something you can control and work on? Are your daily activities creating purpose? Are you allowing yourself to be open to stress factors? Are you a people pleaser or do you keep boundaries? Do you embrace mistakes as a learning tool? Are you avoiding negative people? Take a quiet stroll in the outdoors. 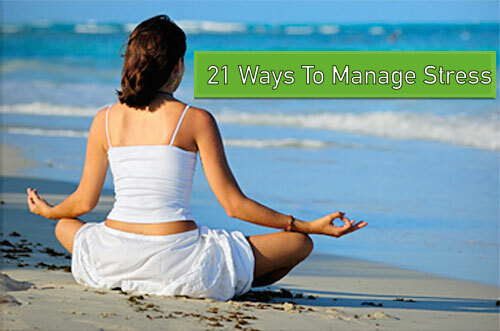 I hope you found this article on 21 Ways To Manage Stress helpful.